Adam likes what he sees in the Collector’s Edition of the sequel to the Canadian Horror phenomenon The Gate, Gate II which is released via the fine folks at Scream Factory. Is it sacrilege to say that I liked Gate II more than The Gate? If it is, I still don’t care. There’s a sincere goofiness to everything that happens in the film. Something not present in the original. Think of it as a comparison between House and House 2. Both completely great and awesome horror films but your preference will come down to your tastes. Rather than continue to focus on Stephen Dorff’s Glen, Gate II’s main character is Terry (Louis Tripp) still into the occult but now in High School. Terry has a plan to conjure the demons from the Gate but this time to help his alcoholic father get a job and some semblance of a life. As it is with most horror films, this does not go according to plan. Enter John, Liz and Moe three “bad kids” that seem to want to push and pull Terry to bring out the worst. Director Tibor Tracás and screenwriter Michael Nankin take the simple premise of The Gate but transfuse into your typical John Hughes-ian plot. The result is something altogether silly, fun and oddly heartfelt. Terry is a good kid with some odd interest (occult, witchcraft, et. al.) but his intentions are good. He wants nothing more than to have his family back together (shades of Pretty in Pink) or at least his dad to not be the alcoholic he’s become. There’s a sincerity to how everything plays out that like Hughes pictures, Gate II absolutely means. It is the reason that Terry and Liz’s friendship and the eventual relationship works. The subplot is so genuine and is so meaningful to the film it works in spite of itself. Like those 80’s High School pictures there a sense of taking teens and their issues seriously that gives life to this sequel. Yes, it overflows with the clichés of the high school genre including John bullying Terry, the stupid bully’s sidekick, and Terry standing up for himself third act. The major difference is that Gate II plays this all out in a sort of demon infused elseworld more akin to Clive Barker than anything from John Huges. The results are hilariously spectacular. A new 2K Scan of the Interpositive was created just for this release. Having never seen this sequel I do not have a reference point for prior editions. I can definitely say Scream has done their job as the film looks consistently clear and crisp. 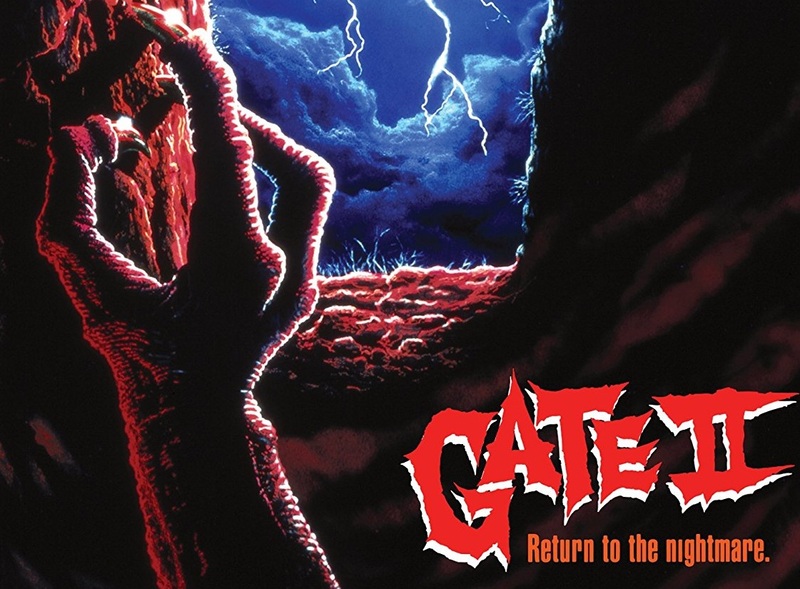 Return To The Nightmare – A Look Back At Gate II is a twenty-seven-minute roundtable interview with Director Takacs, Screenwriter Nankin And Special Visual Effects, Creator Cook. The three men’s interactions make this a worthy and fun discussion. All three men are obviously still friends and have a great time talking about the making of the sequel. The group discusses the surprising success of The Gate (it was at the time the second most successful Canadian film next to Porky’s) and how that affected the timetable on producing the sequel. It’s actually a quite fascinating look at the sequel that all three men eventually became involved with. From The Depths is a 15-minute interview with Make-up Effects Artist Craig Reardon on the making of some of the practical make-up in the film. Much of the film was done with forced perspective requiring Reardon to create suits and actual effects for the various imps and demons that populate the film. Theatrical Trailer, Video Promo, Video Store Contest Promo all included are cool promotional items that will give anyone a serious case of flashbacks especially if you worked at or knew someone who worked at a video store. The coolest is the Video Store Contest which was actually on an audio cassette and Screams solution for this rather than have a black screen is the kind of small details that separate them from so many other boutique labels. For a forgotten and unloved sequel, Gate II has been treated with the utmost respect and care by Scream Factory. Canadian Horror fans rejoice, you have a worthy edition of Gate II to sit alongside your Vestron Collection edition of The Gate. Recommended. Scream Factory’s Blu-Ray edition of Gate II is available now.